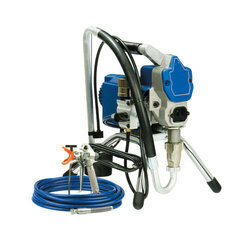 We are a leading Distributor / Channel Partner of graco airless electrical airless paint sprayer, mark iv electric paint sprayer and ultramax ii 490 graco electrical airless paint sprayer from Bengaluru, India. We are the leading supplier of Graco Airless Electrical Airless Paint Sprayer made from high quality material at competitive prices. Packaging Details: good sea worthy / air worthy packing. 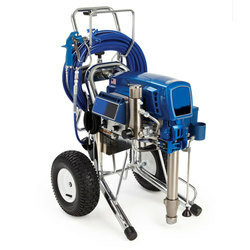 MARK IV Electric Paint Sprayer airless sprayer for painting with full package - cart mounted, can apply industrial protective coatings up to 70% volume solids, all decorative coatings like internal and external walls and supports up to 100 ft in height. Electrical Airless Paint Sprayer - 1 HP Motor with 7 years of replacement warranty for Motor against any Manufacturing defects, runs in single phase electricity. Comes with a package of - 1Machine, 1 gun, 1 Tip Guard, 1 Tip, 1 50ft Hose, 1 TSL Bottle.Can apply all interior / exterior building painting, Enamel. Epoxy, PU (Low volume solid). 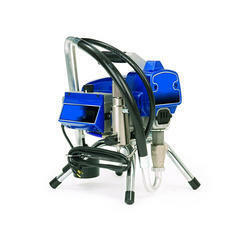 Looking for Graco Contractor Painting Equipments ?